It’s Inauguration Day 2017, the circumstance and pomp are still pomping away, and yet here I sit, along with the rest of the world, waiting to see if our newly installed president will be the equal of our just-departed one, pie-wise. During primary season all politicians love pie. No self-respecting candidate would make a campaign stop in Iowa or Ohio or New Hampshire – indeed anywhere – without scarfing down a slice of freshly baked pie at every small town diner in his or her path. It’s a photo op rife with symbolism: eating pie on the campaign trail sends a message that the candidate in question, regardless of station or breeding, is just like one of us, someone who shrugs off the calories but worries about the mortgage and the leak in the roof and getting the honey-do list finished before the New England game comes on. Pie is proof of our oneness. According to one source, he and the First Family would serve up as many as nine pies for their guests on Thanksgiving day, including huckleberry, pecan, peach or nectarine, apple, sweet potato, pumpkin and several cream pies. It’s little wonder that Obama loved his pies. The double crust pastry recipe used by former White House pastry chef Bill Yosses contained 2 1/2 sticks of butter, 7 tablespoons heavy cream and 3 tablespoons of lard. Nothing against chef Yosses, but I could turn sawdust into a great crust with that recipe. But Obama is far from our only pie-loving former president. I’ve read that Franklin Pierce, our 14th president who hailed from New Hampshire, had a soft spot for “a type of fried apple pie common to New Hampshire” – something of a surprise because I lived in New Hampshire for 20 years and never saw one, save for a type of fried apple pie common to McDonald’s. They say that the rugged Mr. Lincoln liked his lemon tarts, and James Garfield favored plain apple pie. You wouldn’t be surprised to learn that Jimmy Carter was a fan of peanut butter pies. But it is our 11th president – James Polk – with whom I feel a special pie connection since hearing that we share an affinity for vinegar pie. Polk was born and raised in my adoptive state of North Carolina. He later went on to serve as governor of Tennessee and, by virtue of his southern roots, understood that the best and most economical way to tame a sweet pie is with a touch of vinegar. Indeed, vinegar is the secret ingredient that tempers the sweetness and adds a bit of pucker to many a southern chess pie. 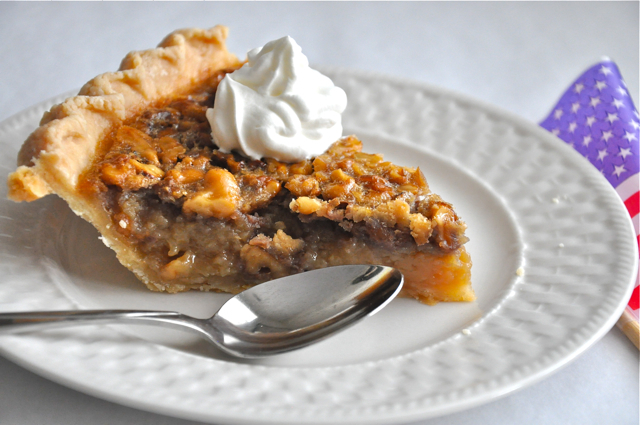 Which brings us to my recipe for Maple Walnut Vinegar Pie, a sort of north meets south creation you’ll want to try. The recipe – first brought to my attention by my friend Richard Sax, the late food writer – is a variation of one in my Maple Syrup Cookbook. 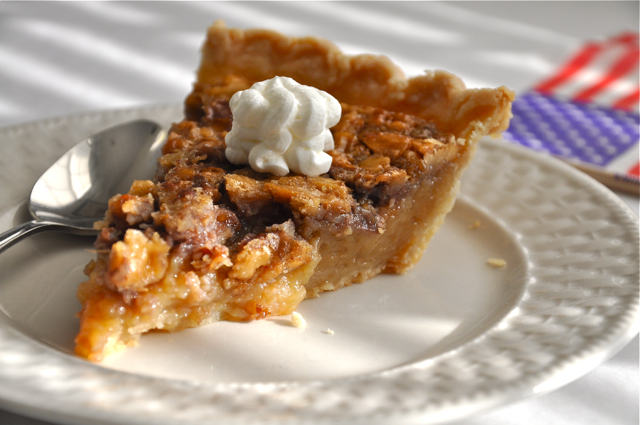 It’s something like a slightly tart pecan pie, but made with walnuts and fewer of them. I think you’ll quite like it. It’s not over-the-top sweet, but enough so that you’ll want to serve it with lightly sweetened, or even unsweetened, whipped cream. Who knows: maybe vinegar pie will be all the rage by the time the next primary season rolls around. Now that would be something to tweet about. PASTRY NOTE: Use any single crust pastry recipe here that you like, including the Good Basic Pie Dough or Food Processor Pie Pastry. You can find others by clicking on the Table of Contents tab above. If you haven’t already, prepare the pie dough and refrigerate it for 1 1/2 to 2 hours before rolling. On a sheet of lightly floured wax paper, roll the dough into a 13- inch circle. Invert the pastry over a 9- or 9 1/2-inch deep-dish pie pan, center it, then peel off the paper. Gently tuck the pastry into the pan without stretching it. Sculpt the overhanging dough into an upstanding ridge and flute, if desired. Prick the bottom of the pie shell 6 or 7 times with a fork. Refrigerate for at least 30 minutes or place in the freezer for 15 minutes. Set the oven temperature to 350°. Combine the brown sugar, maple syrup, and butter in a large saucepan. Heat the mixture, stirring more or less nonstop, until the butter melts and the brown sugar become a little less granular; it probably won't melt completely. Do not boil. Remove from the heat and stir in the tea or juice, vinegar, vanilla, and salt. Cool for 5 minutes. Whisk the eggs in a large mixing bowl until combined. Using a ladle, slowly whisk the warm sugar mixture into the eggs. (Adding it slowly will temper the eggs so they don't scramble.) Stir in the walnuts. 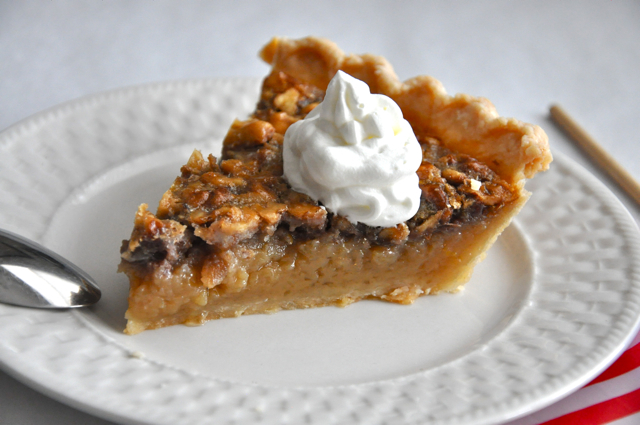 Slowly pour the filling into the prebaked pie shell, raking the walnuts here and there to even them out. Bake the pie on the center oven rack for 40 to 50 minutes. When done, the pie will puff up slightly and jiggle when you nudge it. There should be no soupiness in the center. Transfer to a rack and cool thoroughly. Refrigerate for at least several hours before serving. NOTE: I never did have the chance to ask Richard Sax, who first told me about vinegar pie, about the significance of the brewed tea in this recipe. It's an unlikely ingredient for a pie and since I almost never drink tea, I added the apple juice as an alternative. On the rare occasions I have used tea, I've used brewed lemon tea since it seemed like a good match for this sweet-tart pie.